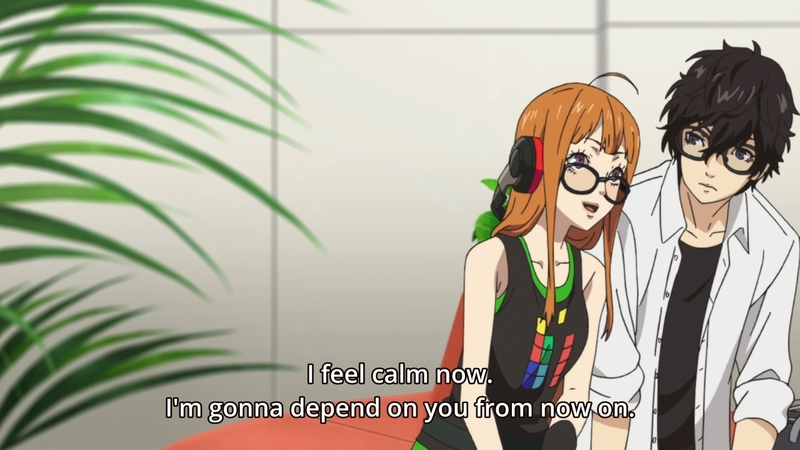 — Futaba has officially joined the team, but she’s a bit socially awkward. It’d be difficult to work together if she can’t talk to the rest of the gang properly, so they band together to help draw the girl out of her shell. This will eventually culminate in a trip to the beach. — Man, CloverWorks can’t even draw this woman’s face correctly. 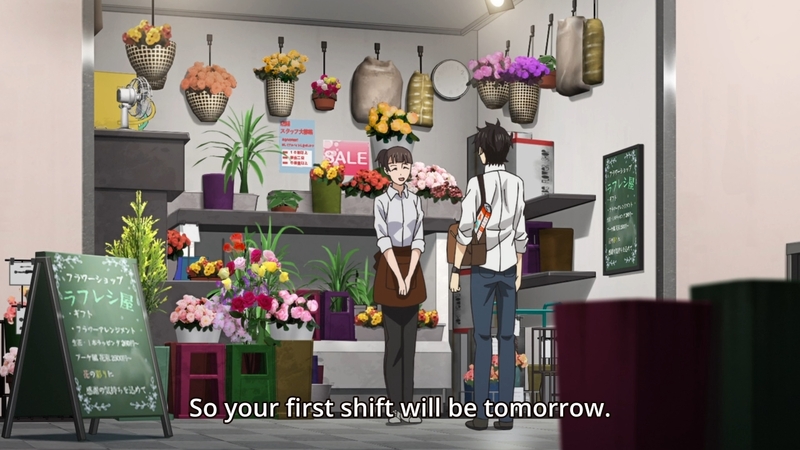 Speaking of the flower shop, I barely ever worked there. There are better places to go for charm. — Sojiro’s supposed to be a good guardian for Futaba, and he probably is. Nevertheless, he’s not doing himself any favor by letting the girl live in such a pigsty. C’mon, the trash bags are piled high enough to reach the ceiling. 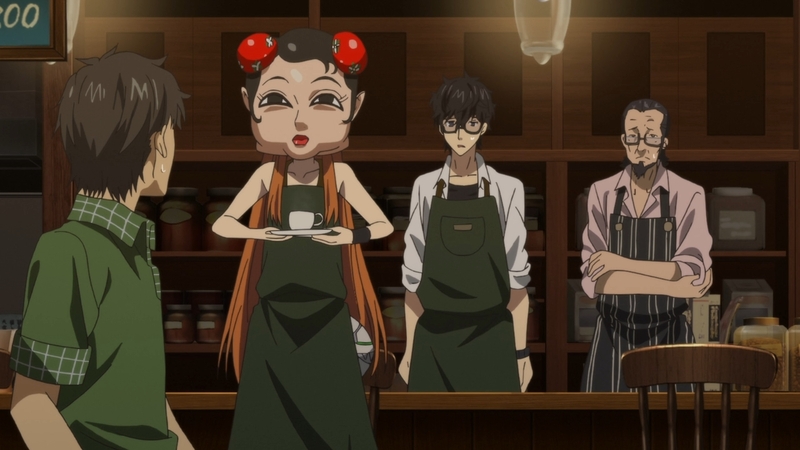 — I also think there’s something off with Futaba’s face here. — In the interest of time, the adaptation cuts out a lot of humorous moments. 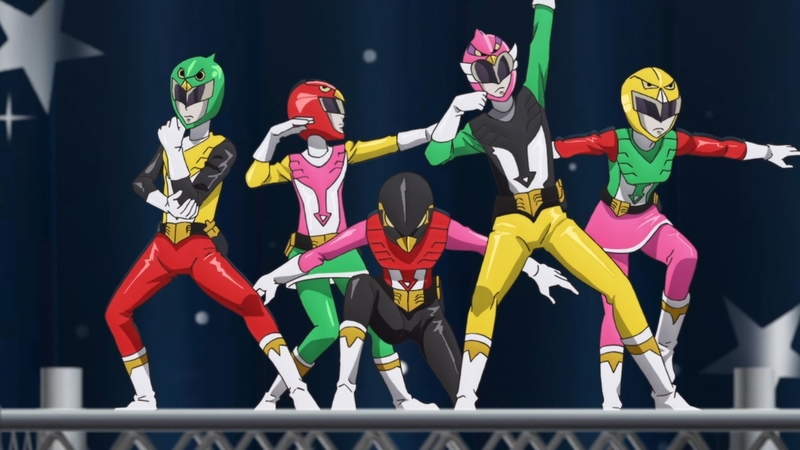 The scene involving those Super Sentai dolls barely even makes sense in the adaptation. First, we see them being arranged like this, then we see Yusuke looking concerned. If you’ve played the game, you would understand exactly what happened. If you haven’t played the game, I guess all you can do is just guess. 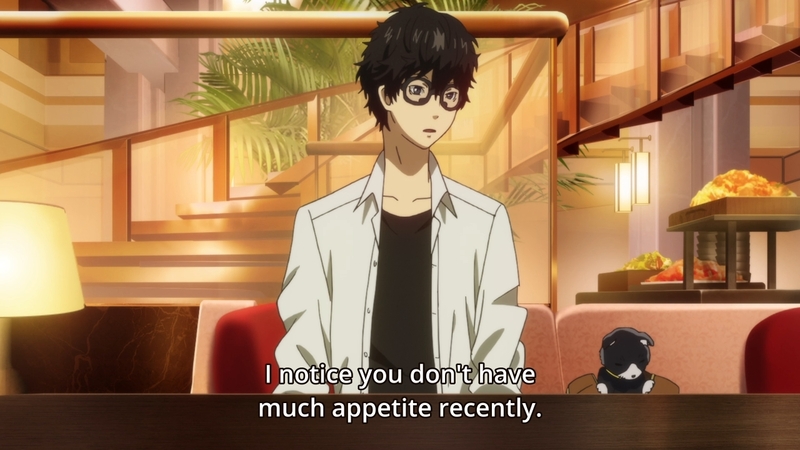 — This episode is all over the place as Ren spends a bit of time with some of the more attention-starved members in the cast. 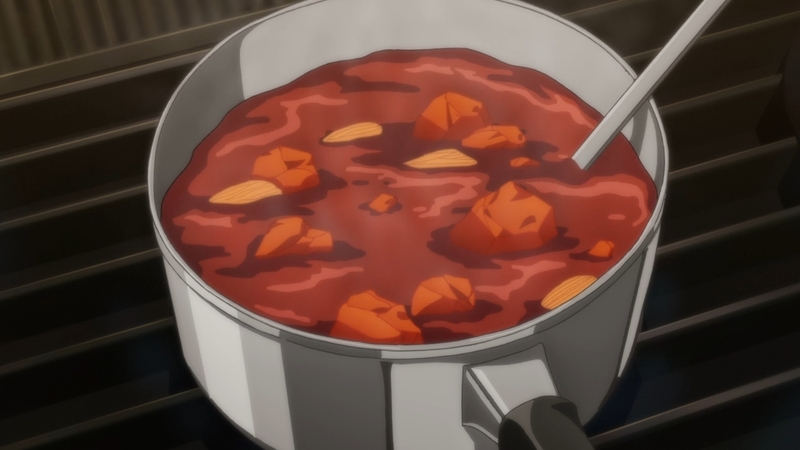 For instance, Sojiro finally teaches him how to make curry. — That sure is one red curry, tho. 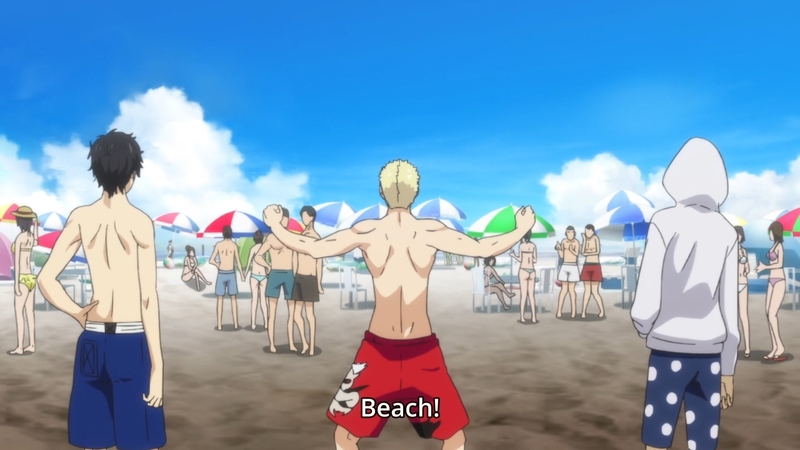 Nevertheless, Ryuji approves. He seems like a guy who would eat anything. 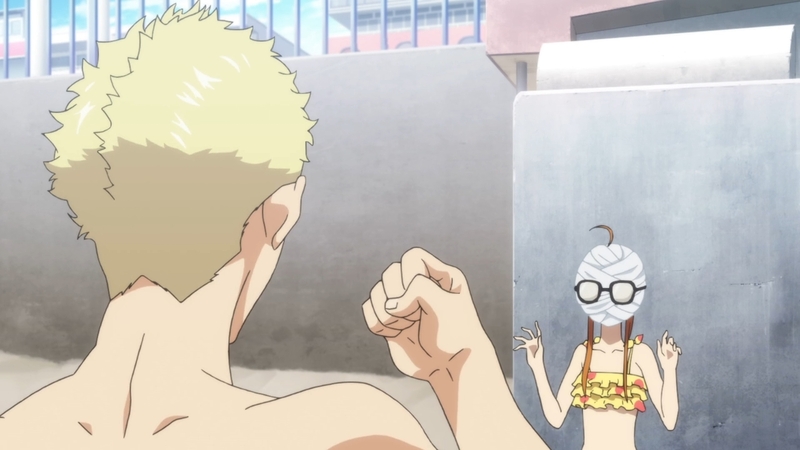 — Eventually, Ann and Makoto drop by with a swimsuit for the team’s favorite hacker. When they go upstairs for Futaba try it on, you can clearly hear Makoto’s voice. Nevertheless, when the show cuts to the boys, the student council president is standing down there with them. It makes no sense. — But finally, we get our beach episode, so that means fanservice, more fanservice, and… well, I’m sure someone out there has this fetish. –The adaptation switches things up a bit. In the game, the beach scene is a bit of a letdown, because the group doesn’t really spend all that much time together. The girls leave to do their own thing, which kinda pisses off Ryuji and Morgana. Of course, Ren’s reaction is up to the player. 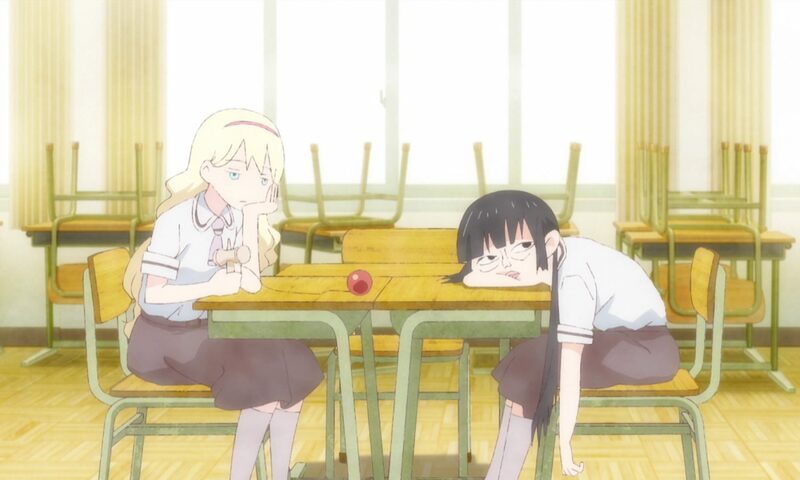 In the adaptation, however, everyone seems to have a great time. 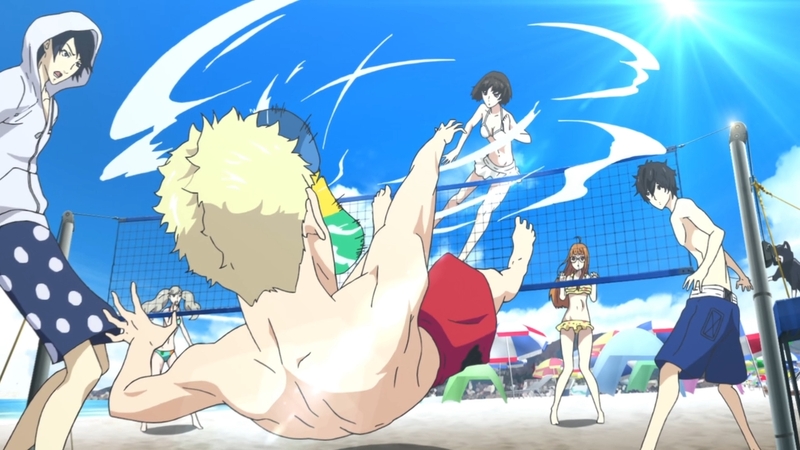 You even see Makoto apparently school Ryuji in beach volleyball. 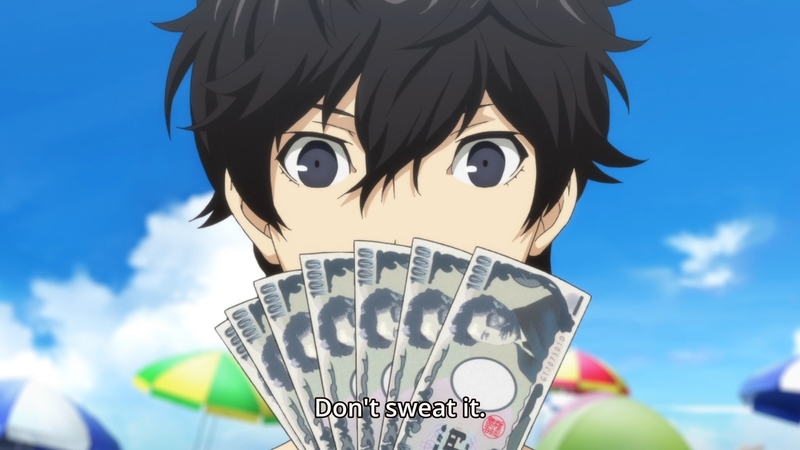 Ren also whips out a fat stack of cash to help the girls pay for the banana boat. 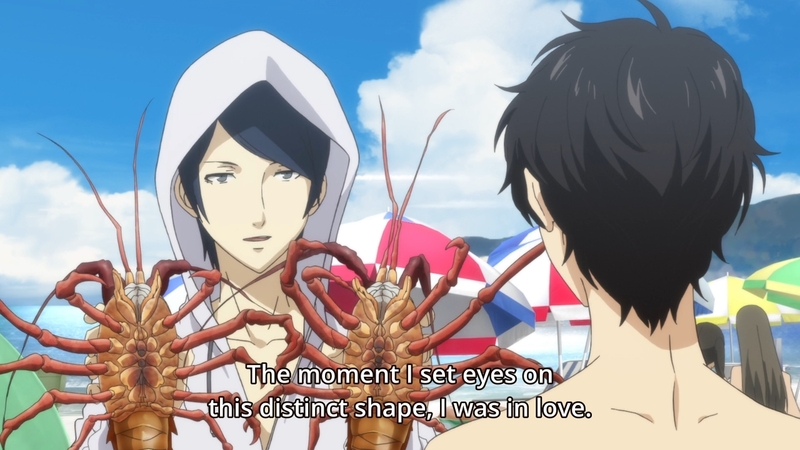 — We still get that classic moment with Yusuke and his two stupid lobsters. 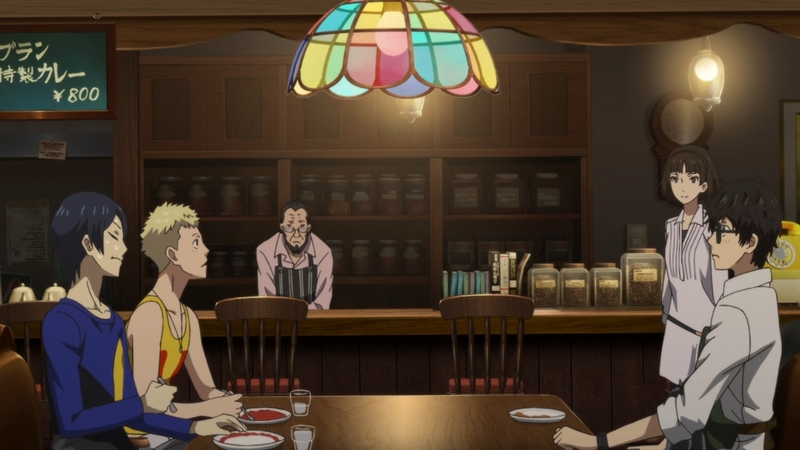 — Most of all, CloverWorks left out Ryuji’s second encounter with Atlus’s horrendously offensive gay characters. They kept his first encounter, so why I wonder why they decided to ditch this one. 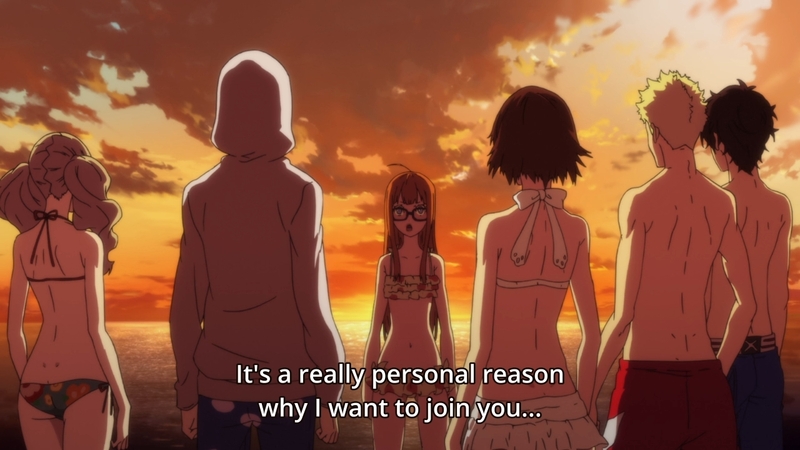 — At the end of the day, Futaba opens up about her motivation to join the team. She believes her mother was murdered, but she wants to know exactly what happened. 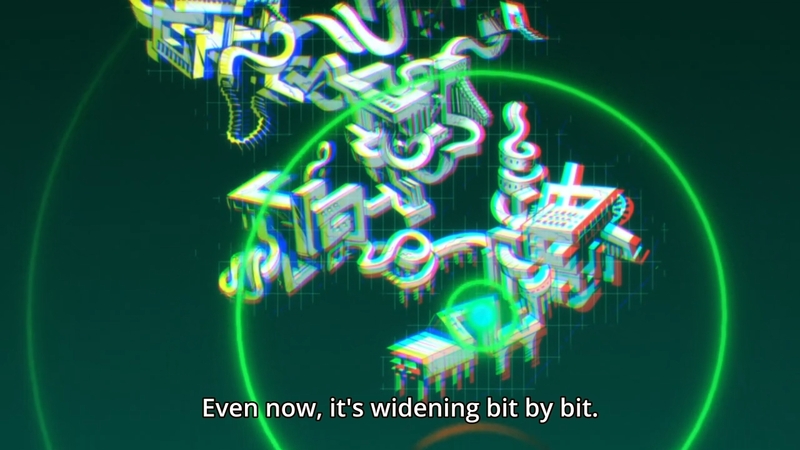 Basically, someone stole Wakaba’s research and wiped all traces of it. If you’re the only person who knows anything about the Metaverse, you obviously have a huge advantage over everyone else. 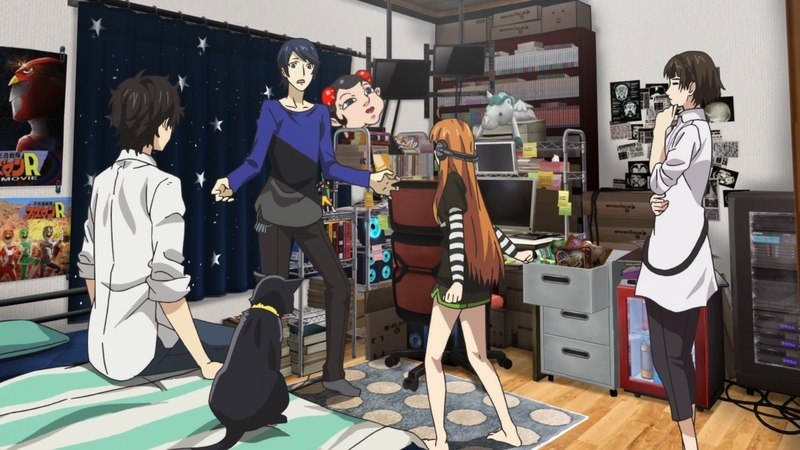 — With Futaba’s skills, the group expects to do even better when they explore the Metaverse. Of course, this hardly comes across in the adaptation, because we rarely ever get to see the group run around the Metaverse. Nevertheless, this leaves Morgana feeling a bit inadequate. 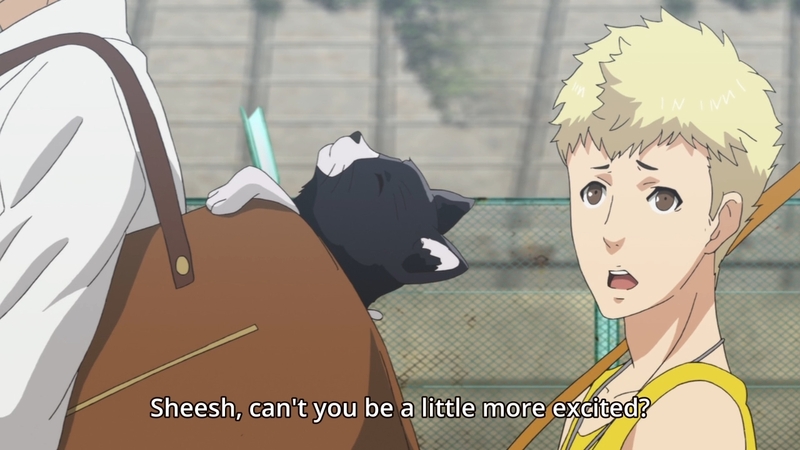 It also doesn’t help that Ryuji is all to eager to needle the cat about it. There’s no point in casting blame. All story long, Morgana has taken every available opportunity to make fun of Ryuji. If you play the game, it’s even more obvious. As a result, it shouldn’t surprise anybody that Ryuji would retaliate. 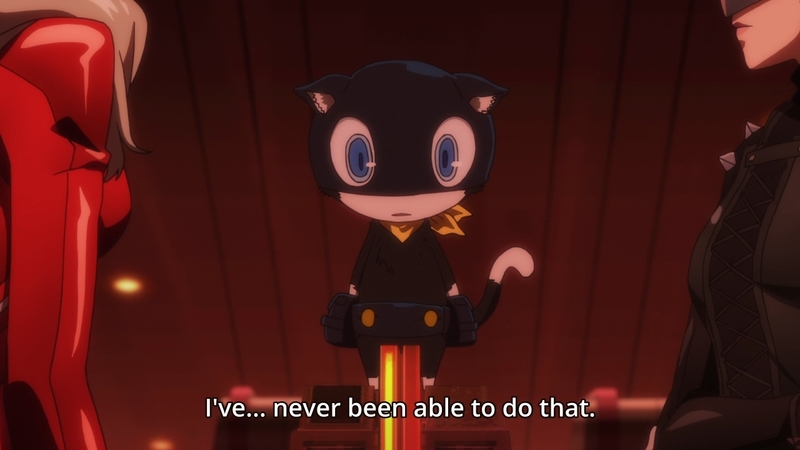 Morgana kinda brought this on himself. — But Morgana’s issues go even further than that. He’s always insisted that he’s human. He’s just taken a cat form for some reason that he can’t remember. Lately, however, the cat’s been having these nightmares where he sees himself as just another Shadow. The cat is more unsure of himself than ever. — For some reason, we get to visit the docks. This is where you can bump into Kawakami. I have never bothered to fish in Persona 5, though. 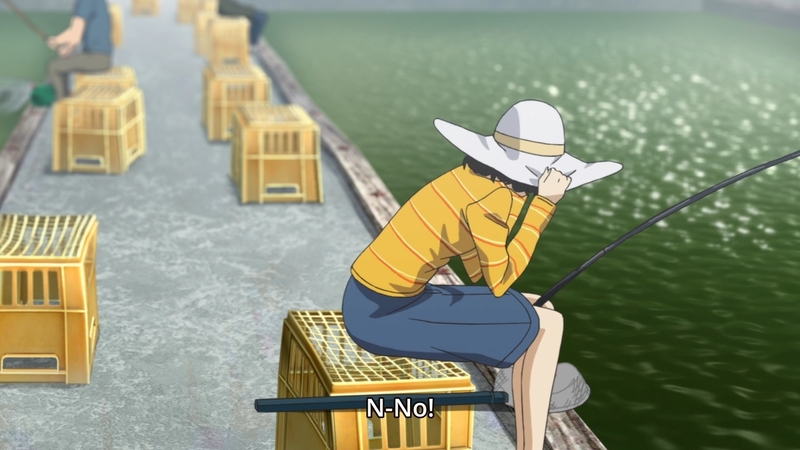 Let’s just say Persona 4 ruined any enthusiasm I might have had for fishing. 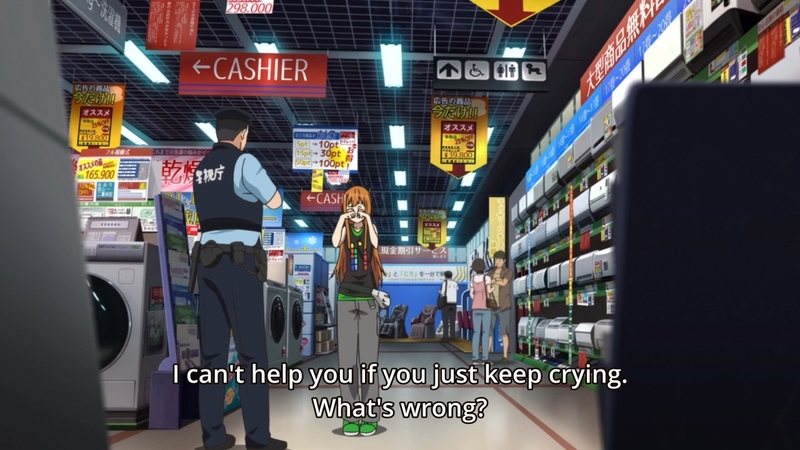 — Eventually, Futaba needs help. She thought that she could finally go out into public on her own, but you can’t beat social anxiety in a single day. So of course, Ren comes to her rescue. 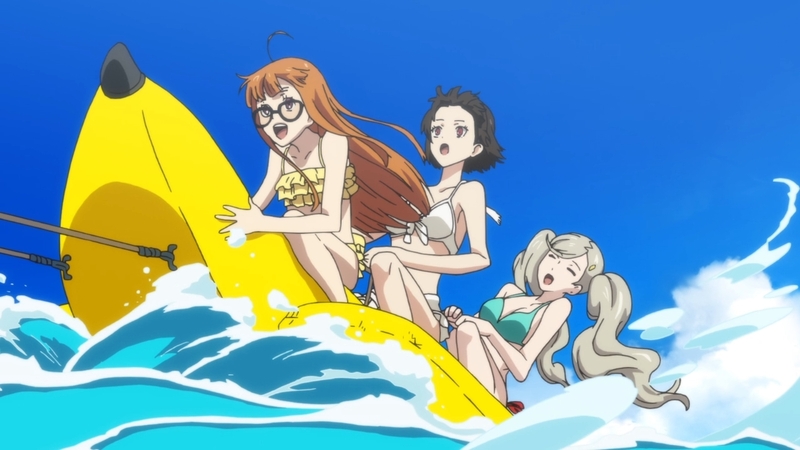 — The team takes this opportunity to take Futaba on her first trip to the ever expanding Mementos. Not only does she get her code name, but she also quickly determines that Mementos is expanding due to the Phantom Thieves’ surging popularity. Once again, this makes Morgana feel worthless. — Afterwards, we hang out with Mishima. He barely contributes anything to the story. Rather, it seems that we’re only here to give Ren a moment to speak to Morgana alone. 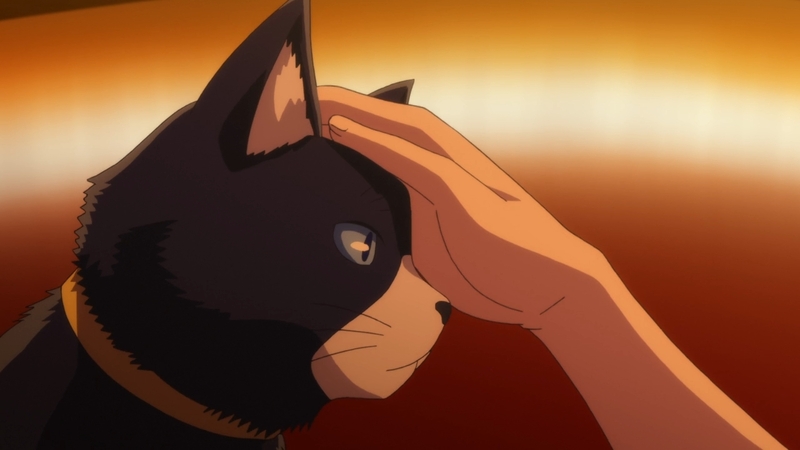 In the game, you can tell that something is off with Morgana around this time, but the player is never given much of an option to help cheer the cat up. 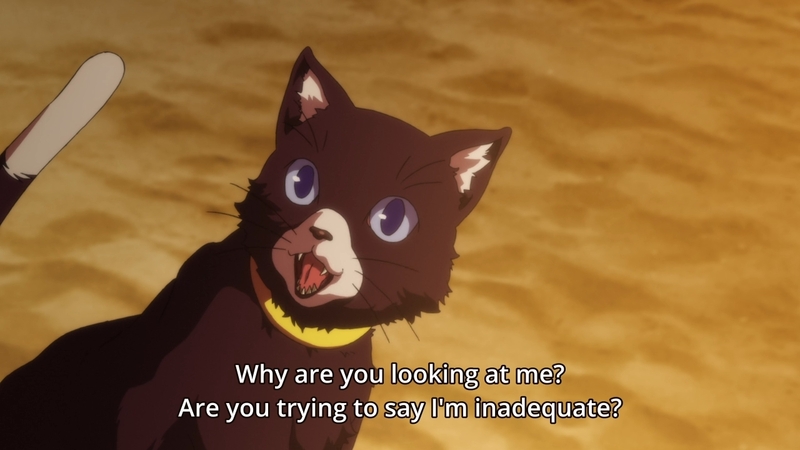 The adaptation at least has Ren attempting to reach out to Morgana. He just doesn’t get very far in this endeavor. I like it, though. — We then cut to an unpleasant encounter between Ann and Mika, a rival model. In the game, you need to have hung out with Ann for quite a bit before Mika finally shows up. I guess we’re just skipping all those moments for the adaptation. I’m not sure if I like this move or not. I rather like Ann overall, but I have to admit that her social link makes her look like a complete and utter airhead. I guess Atlus really saw her as a vacuous blonde. In the game, we don’t really see that side of her all that much. For instance, even though Mika totally sabotaged her in this scene, Ann ends up being inspired by her rival in the game. 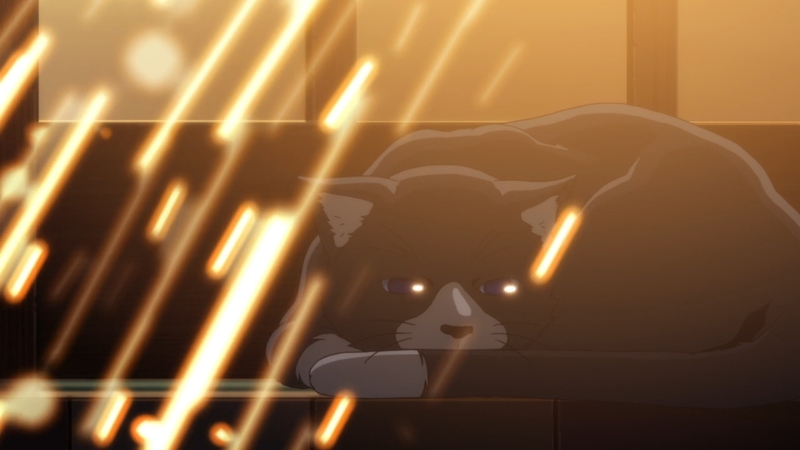 But in the adaptation, they instead use this moment to once again play up Morgana’s current issues. — The cat wants to cheer Ann up, but the girl assures him that she’s fine. In fact, she refers to him as the team’s mascot. This leaves Morgana feeling a bit despondent. She doesn’t mean anything by it, but obviously, Morgana sees himself as more than just a cheerleader. He’s supposed to be their mentor in all things thievery. They’re supposed to rely on him in the Metaverse. Most of all, he’s supposed to be indispensable. I’ll elaborate on this in a bit. 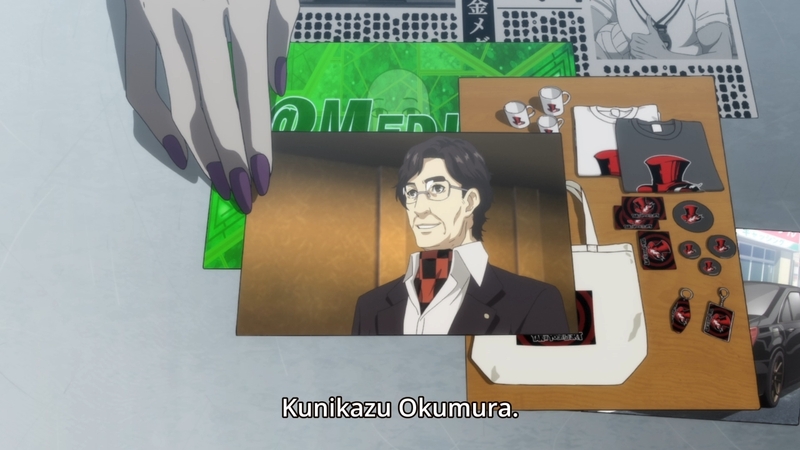 — We get a short scene in which Sojiro explains why he feels so guilty about Wakaba’s death. Basically, the woman had told him that her life was in trouble, but he didn’t take it seriously enough. Even if he did, there wasn’t anything he could’ve done about it. Nevertheless, he’s been carrying that guilt ever since. 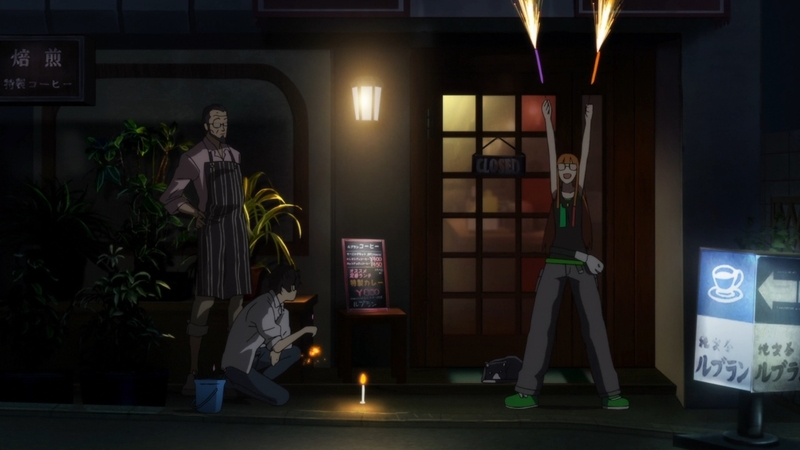 — At the end of the night, everyone celebrates with a bit of fireworks. Everyone but Morgana, of course. 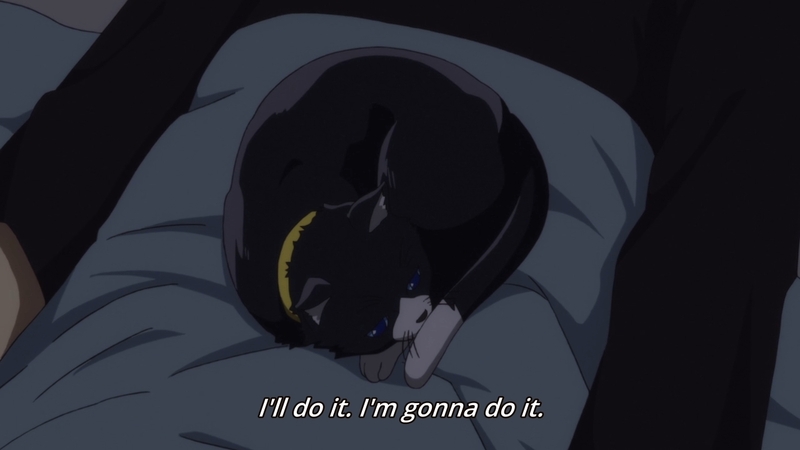 — Afterwards, Ren manages to cheer Morgana up a bit by reminding the cat that they have an important mission. They are agents of justice! They will defend the weak against the strong! 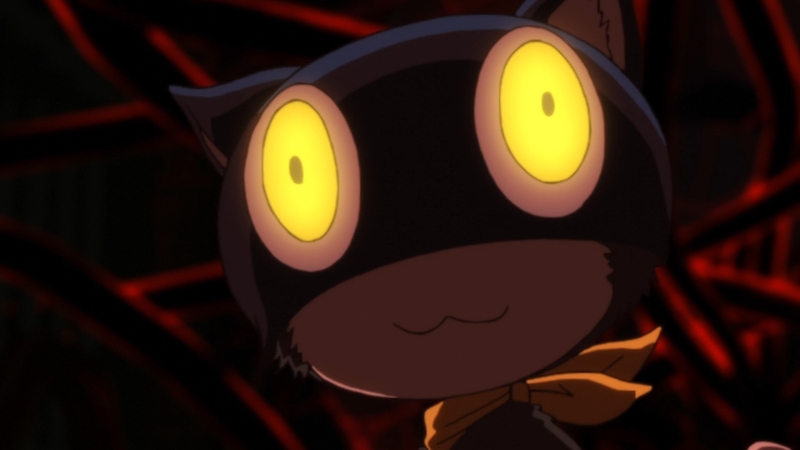 Also, he’s confident that Morgana will definitely get his true form back after everything is said and done. This will explain why Morgana ends up being so gung-ho and dead serious about their mission in later events to come. — Still, despite Ren’s nice words, this doesn’t really get to the root of the issue, which is that the cat feels less needed by his team. After all, he already sees himself as an outsider. As much as he wants to be human, he doesn’t really believe that he is one in his heart. So for him to be needed, wanted, and loved by his teammates, he has to be useful. 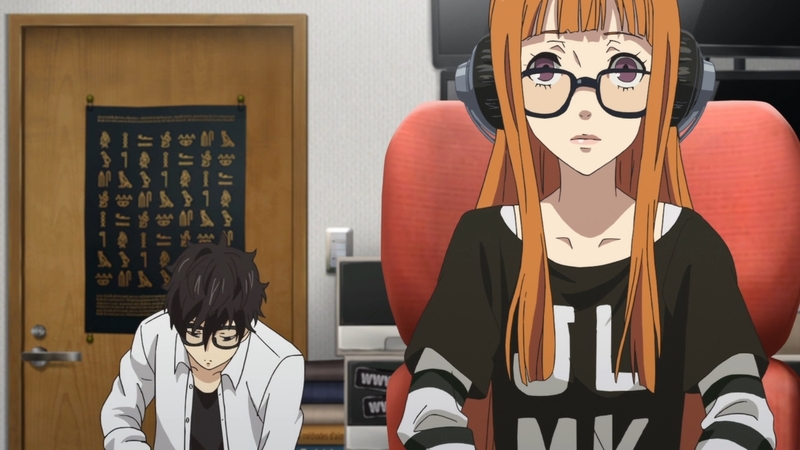 Unfortunately, Futaba makes Morgana a bit redundant. — Morgana makes fun of Ryuji a lot, and you can attribute some of that to mere jest. But there’s some truth to his jokes as well. You don’t constantly make fun of someone if you don’t actually hold some contempt for them. 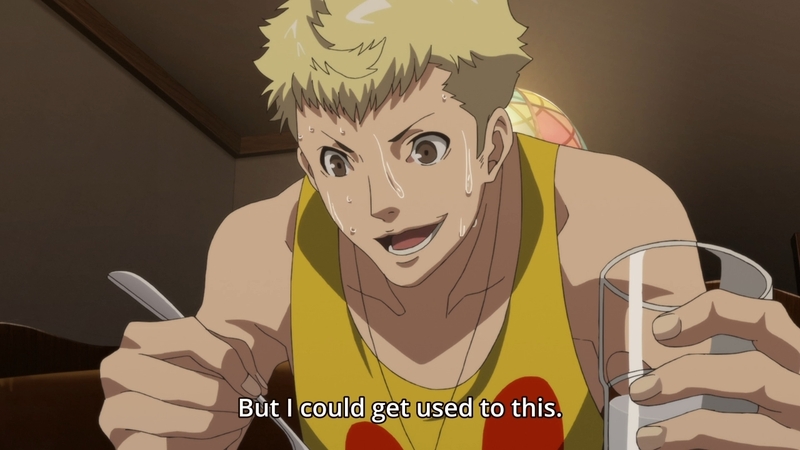 And the truth is, Ryuji is just a fighter right now. Same with Yusuke and Ann. Ren’s obviously the leader. Makoto supposedly provides the strategy. 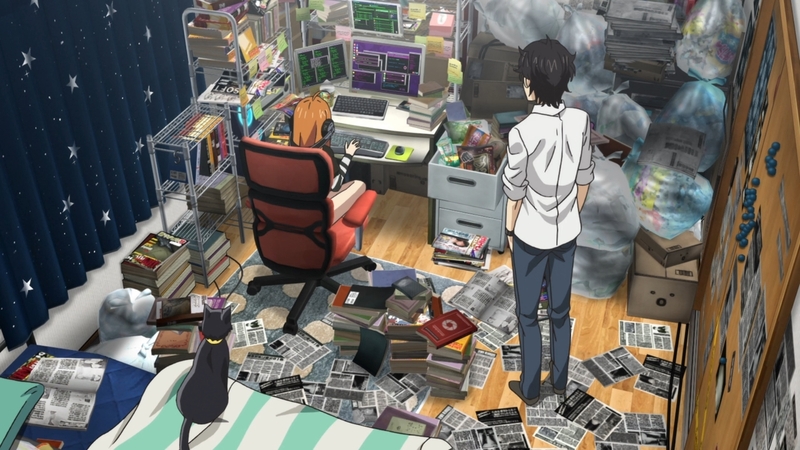 Futaba provides the information, and this used to be Morgana’s role. He kinda doesn’t have a role left. He doesn’t really want to be relegated to just another peon, because if that was the case, the team might not need him. As mushy as it sounds, Morgana just wants to be appreciated. He’s a bit too self-important, though. — But y’know, it goes both ways. The cat hasn’t really been the best teammate up until now. But we’re getting ahead of ourselves. Morgana’s big dramatic moment is still to come. — In the meantime, we have a trip to Hawaii. Also, the next big villain and his Palace looms ahead.